Installing a pneumatic Shuttle Valve quickly and easily allows the actuation of a cylinder or control valve from two or more locations. Also known as "OR" valves, Shuttle Valves automatically select the higher of two pressures allowing flow from one input to the output port. Simply connect your control valves to the shuttle's input ports and actuate either valve to shift the metal core and block the opposite input port. The internal design of Pneumadyne’s Shuttle Valves provides a low cracking pressure, allowing media to quickly flow through the output port to the cylinder or valve at the end of your circuit. Contact us for more information about our pneumatic shuttle valves. Didn't find what you’re looking for? Request a Quote for custom requirements. A variety of porting options are available to meet your application’s plumbing requirements. Choose from threaded, barbed and push-to-connect ports to speed installation in your device. Pneumadyne Shuttle Valves have a cracking pressure of less than 1 psi which allows liquids or gases to flow quickly to the output port. Swivel ports make it possible to align the valve however you need to, eliminating the need to add extra fittings. Shuttle valves feature electroless nickel plating or a combination of electroless nickel plating and black anodized bodies, to protect the valve from corrosion. 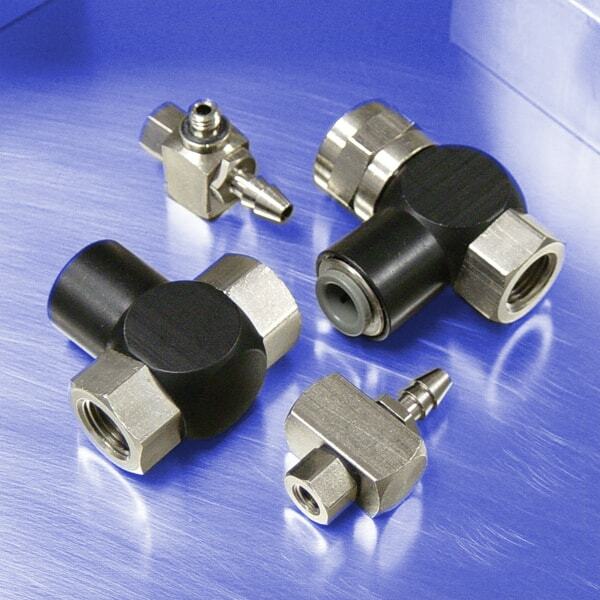 Small in size, Pneumadyne shuttle valves are ideal for applications with limited space. Pneumadyne offers a wide selection of shuttle valves, ensuring that we have the right size to fit all types of assemblies. Shuttle valve ports range from 1/16 tube ID barbs to 5/32 OD push-in connectors.